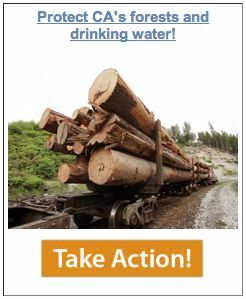 THPBlog: Sierra Club Alert: Stop Clearcutting in California's Forests! Sierra Club Alert: Stop Clearcutting in California's Forests! Right now, California’s forests are at stake. Will you stand up to protect them? This summer, big timber companies are headed from the Oregon border to the redwoods and to the forests just outside Lake Tahoe and Yosemite. They're bent on clearcutting tens of thousands of acres of forest -- threatening our drinking water and increasing the risk of forest fires near our communities along the way. 75% of California's water supply comes from our forests, so why are we allowing clearcutting to continue? Governor Brown has the power to halt this destruction. Tell him enough is enough -- it's time to stop clearcutting in California. In a clearcut, the vast majority of trees are chopped down and the same area is usually doused in herbicides -- chemicals that can seep into our drinking water. Where there used to be natural forests teeming with wildlife, we're left with industrial tree farms, erosion that fouls our watersheds, destroyed wildlife habitat, and increased fire risks. Send a letter to Governor Brown asking him to take leadership to protect our forests and communities from destructive clearcutting.